This is the conclusion of Marie Catrett’s three-part guest post on the methods and results of daily documentation at Tigerlily Preschool. If you haven’t already, be sure to read Part 1 and Part 2 first. And feel free to share your own thoughts or questions for Marie by clicking on “Post a Comment” below. We return for a second visit to the train station. This time Elias is on his feet, exploring everywhere, bursting with excitement. 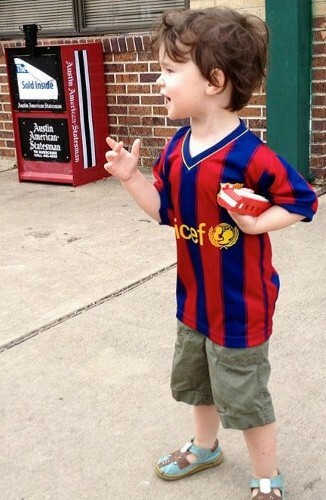 Elias: (At the station, before its arrival) Waiting for the train to come! Waiting for the train to blow its horn! It’s the train, it’s the train! Talked to the conductor! I tell the children that I will take pictures of anything they think is interesting. I notice that on our second visit we’re paying more attention to other vechicles and people. Wyatt: A man driving a truck and a part of the train. Willa: A train and a honking thing. Emerson: See a guy driving it. Waytt: In the back there’s a black part. Willa: Yeah, that’s where they would sit. Willa: Or anybody could sit in the back. Willa and her mom visit with some passengers from the train. Nayeli visits with the station master. Reflecting more about our second trip to the train station, we listen to the recording I made of the train’s arrival. Listening to the sound of the train arriving at the station. Emerson: (Whistle sounds) A train! Wyatt asks me to play the clip again and again. Elias notices a stack of laundry baskets near us on the blue rug. Yesterday Wyatt and then Emerson discovered that they could climb into the red basket that usually holds paper for painting. Paired up with my black laundry basket, climbing in and out became a popular thing to do yesterday. 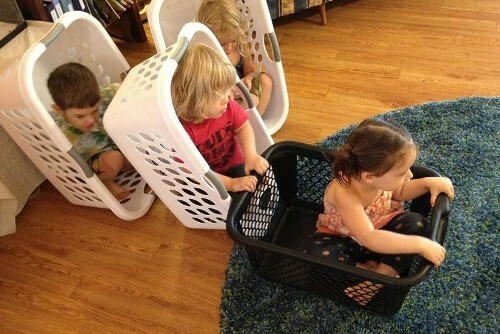 It was pretty hard to wait to climb inside; whichever kid was in the basket wanted to have a really long turn. Wyatt told me that he wished we could have more laundry baskets at school, and would I write that down? Willa makes notes about a friend’s construction. Now Elias notices and unstacks these new baskets, climbing inside one. A “play explosion” then takes place—laughing, hooting, rocking, crawling . . .
After a while I sit again next to Elias on the sofa. He joined in at the beginning for a bit and then decided to watch. We are both transfixed by all the stories that are forming and bouncing off each other in the center of the room. Often four children are involved, sometimes pairing up two and two, then rejoining again as a group. Nayeli, Wyatt, and Willa all seem to take turns leading the play. Emerson is very eager and willing to support the next piece of the narrative, joining in with so much joy. Elias makes up a new song, “The Wheels on the Passenger Train,” which I play on the guitar and we sing together. We add “The Wheels on the Passenger Train” to our song list. 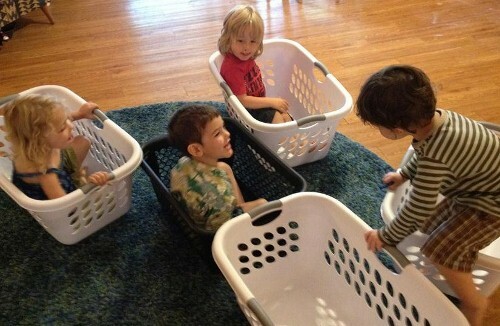 Wyatt starts laundry basket play again and announces that he’s playing train station. I tell him: Come tell me if you’d like to hear the train sounds when you play. Wyatt is excited about this idea and asks to hear the audio clip. Elias: I have to go catch . . . I have to go! Wyatt: Quickly! Elias: Ding, ding! (Train horn honks) Ding ding! Emerson: Again again! We start the recording again. Elias: Train, train . . . I have to go catch the train! (Train horn) The train!!! Willa: (Climbing into a basket) I’m a conductor. 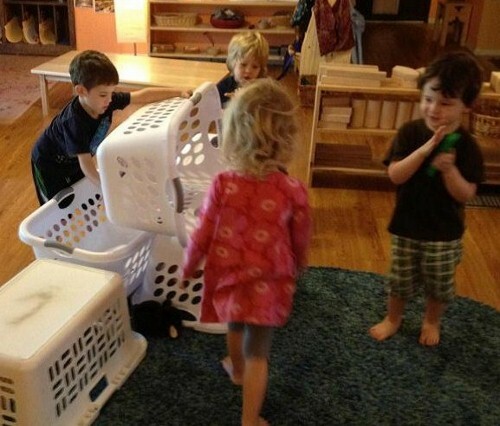 Basket play is happening nearly every day, directed entirely by the children. 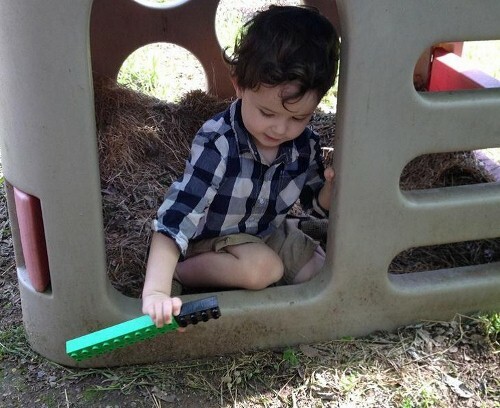 I watch Elias choose to get right in the middle of this joyous, active play and I am delighted to see the connections that train play has created in our classroom. This is my goal for all the kids: our school is a special place that honors and celebrates who you are. And what shall we play today? We look forward to our third visit to the train station, returning later this month. Marie: We are on a trip today to visit the train station. Could we take a look at your suitcase? Woman at the station: Sure. Nayeli: Does yours have a bar that goes up? For pulling? Woman at the station: Yes. Marie: Do you think we could see? Elias (Delighted) It’s the train! The Amtrak train! Look at those tracks. Nayeli: I see the actual train. Elias: Is it the 107 train? Marie: You know, it has a number on it right here actually. One-one-four, this is the 114 train. Nayeli: Headlights! Here are two headlights and another headlight and then two more. 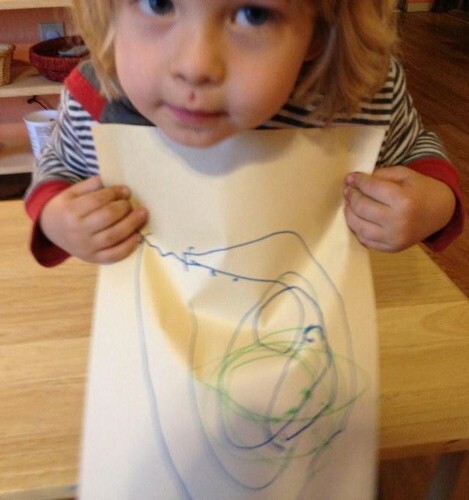 Elias: The train was blowing its horn. Emerson: ‘Member I saw a locomotive. I said hi to the train! Marie: Did it make a noise? Emerson: I was worried. Went chhhhhhhhhhhhhhhh. Emerson: A- CHOOOOOOOO CHOOOOOOOO! Maked noise! It made a big noise! A- CHOOOOOOOO CHOOOOOOO! It was a passenger train. A Amtrak train (is a) passenger train. Saw locomotives! Our first visit to the station. Elias is interested but cautious: he wants to be held by mom during our time there. Nayeli: She has a suitcase and a pillow! She brought a pillow to sleep with! Emerson: (The passengers) Went inside to go to sleep on the train. Need to wake up. Snoring. They were snoring. Elias: Going to have dinner! They’re going to have dinner together in the dining car! Ding ding ding ding! Back at school, train songs have become part of our song list, and we sing them often, at the children’s request. Elias: Sing “Engine Number Nine”! 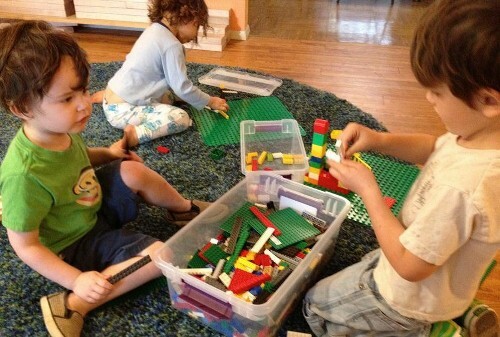 Marie: (Talking to Elias when he selects his Legos) What kind of train will you play today? Elias: It’s a commuter train. It wants to go to the airport. The train wants to take people to Pei Wei (restaurant). Elias: The train is coming out of the train station. 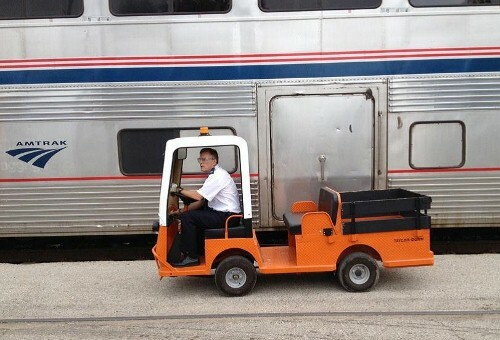 See, it’s an Amtrak train. Bye bye train! Mmmmmm-mmmmmm (making the sound of the train horn). 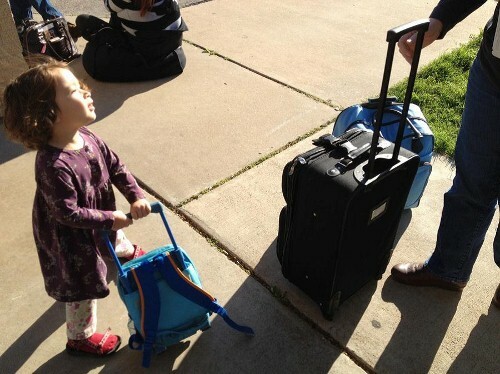 Willa: (Running up) I want to come to the train station! 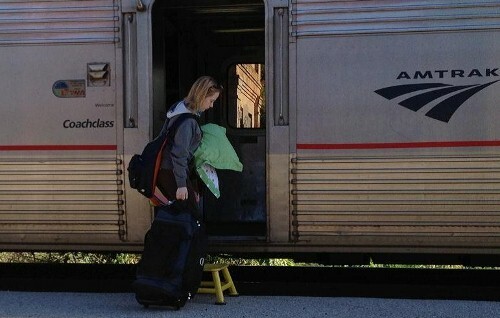 Marie: Oh, maybe you will be an Amtrak train? Willa: First I need to get far away. Marie: Maybe we will hear your horn. 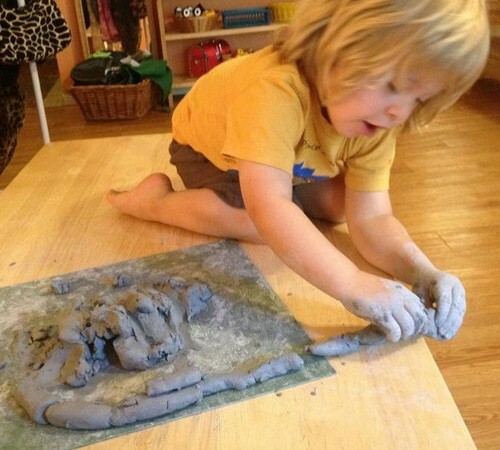 Emerson decides to make a train out of clay. Emerson: Make a track. Tank car, tank car! Make a freight car. Make the freight on it. Make a track . . .
Elias, Nayeli, and Wyatt build vehicles together. Elias: And big ones, and big ones! (Jumping up with excitement) Are those trains ready? They’re going pretty fast! Stay tuned for Part 3, coming June 23. 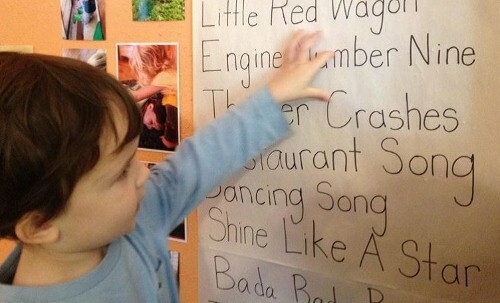 A key element of the Reggio Emilia–inspired approach practiced in a number of Austin alternative schools and preschools is the documentation of children’s daily experiences. 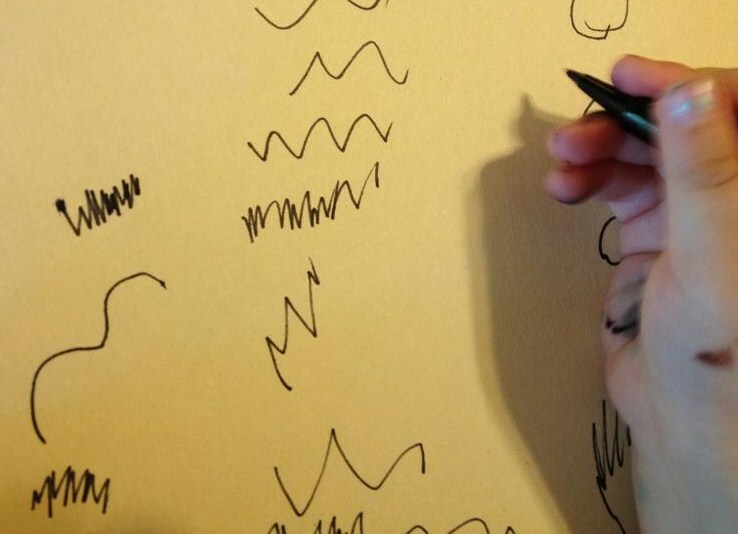 In this three-part guest post, Marie Catrett provides a case study of the thoughtful and detailed documentation that occurs at Tigerlily Preschool. This past January I reopened my in-home program, Tigerlily Preschool. I was excited to return to teaching and eager to bring something new to my work with children. Based on a mentorship that had begun in July 2011 with master teacher Sydney Gurewitz Clemens, I was certain that one of the new things I wanted to bring to Tigerlily was the practice of using daily documentation to record children’s learning. When I made the decision to reopen Tigerlily, Sydney’s first question for me was: how do you plan to use documentation in your program? 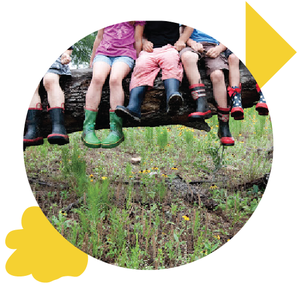 I wanted to pay attention to this particular group of children’s interests, teach with intention, connect families to our journey, and share my work with other folks who might be interested in a playful, creative, and expressive early childhood experience. After each day of class, our families and Sydney receive an email that contains photos and conversations that reflect what went on in our classroom that day. Parents read “Our Day” with their children each evening, and together they talk about their child’s journey at Tigerlily. “Our Day” also resides in paper form in a notebook at school so that the children and I can refer to it and remember our history. Elias is the quiet child in our group, talking most to the grownups in his world. The other kids like to talk to kids. Nayeli’s first words to me at an open house in December were: “Hello. I’m Nayeli. And you’re Marie. This is my new school and all my friends will be here. Oh look, you have animals!” She was not quite three years old. Off she went, creating habitats for tiny toy animals with the blocks, exuding confidence and enthusiasm. Elias was much, much quieter. 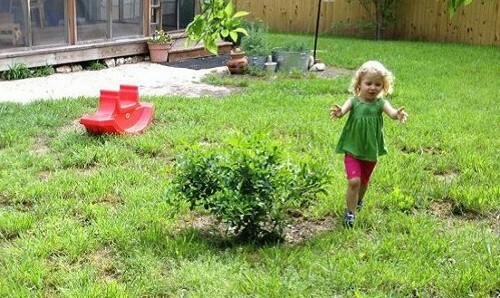 A few weeks into our time together, another child, Willa, asked Elias about wanting to play with a yellow toy hammer, a cherished item in our back yard. He replied to her and she came running back to me, remarking on the experience as a special one. “Elias gave me his words.” When Elias speaks, it feels special to me, too. 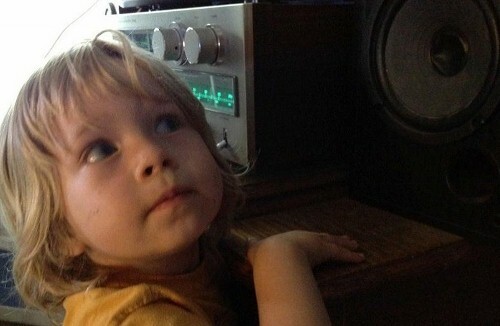 He is a kid who often prefers to start out watching from the sidelines, engaging in his own quiet play. I watched him, took photos, and tried to understand. Gathering data for documentation helped me to pay attention to the details of his behavior, to see what he was interested in, and to support that interest in our classroom. 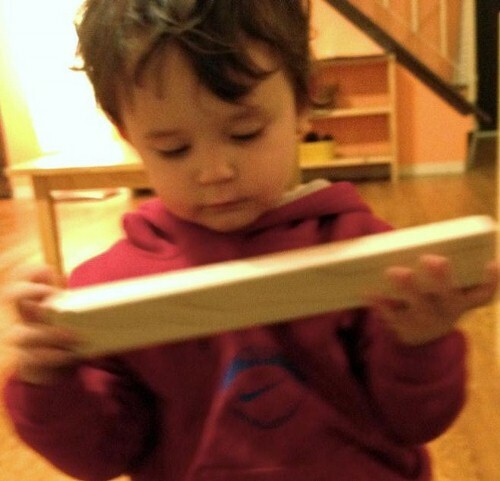 Elias spends a long time playing with a particular building block, moving it slowly back and forth in a way I’ve seen him move a Lego piece about. Later in the day I show him that particular block and ask him what it made him think about today. Remembering that showing Elias the block prompted the train response to my question, the next day I make this invitation: “I’m going to read Freight Train over here. Anyone who wants to hear the story can come, too.” Elias joins us for story time for the first time. The early weeks of school go by, and I am busy introducing the children to the workings of our new classroom. By mid-February I find I can easily pinpoint interests and activities that have excited each of the other children but am left scratching my head a bit with Elias. Following my lead, he has engaged in and explored many activities, but I don’t feel that he has truly arrived at his school. What I most often see him do is carry around either the Lego train set we have, or a long wooden block, or two Legos held close together. He carries them, sometimes making a soft noise to himself. It is a modest activity but always seems to be much richer inside his head than what I see; he’s very focused. I plan to take some pictures of Elias doing this play throughout the morning today. 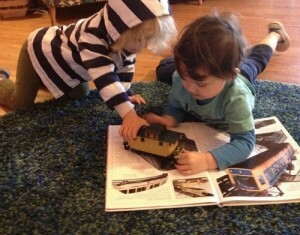 Elias: Reading Trains! There’s a snow train. There’s a Euro Star. It’s a subway train (the wooden block). Is there a passenger train? Emerson: A mountain train, right there (in the book). Elias: It’s a steam train (the blue, red, and yellow plastic train)! Nayeli: A long, long steam train. Elias: It (the steam train) has to pick up the passengers. It’s a snow train (the red and green Legos laid end to end). Marie: Does the snow train make a sound when you play that? Elias: Makes a quiet sound in the snow. Goes . . . (makes a very soft noise). Sydney and I discuss what we see here. We are both very excited to hear so much language from Elias! I tell her how much I’d like to offer something that really speaks to him, and she wonders if there might be a train station that we could visit. Elias returns to the train book, sparking interest from Willa and Nayeli as well. Elias: (excited, to me) Reading Trains. Look at the wheels (touches the wheels on the toy train and the wheels on the train pictures in the book). (Monorail trains) are upside down trains! Willa: There’s a train in his hand. Elias is playing with the train. Willa asks to see the model, takes a look, and then passes it back to Elias. I hear talk throughout the day from the other kids about its lights and the windows. Nayeli: The train is going choo-choo. I peeked in the windows. Train play comes outside, too! 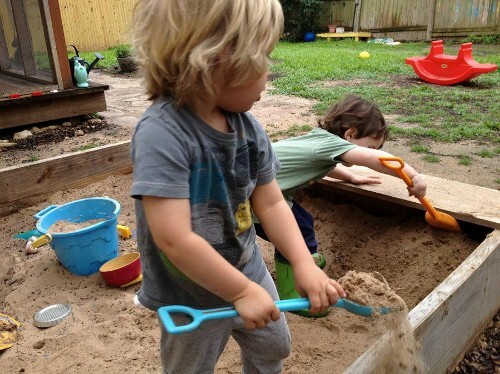 For a second day Elias and Emerson spend a long time working to pile sand up under a corner of the sandbox. Emerson: Making a fire, making a fire! There! Elias: I’m stoking the fire. Where do you want to put the coal? Putting coals into the fire. Here comes the train! That’s part of the blue zoo train. On the track it moves. Trains move on their tracks. Nayeli: I went on a train with my papa. I said “hi everyone!” when I was on the train. Nayeli: (sings) Elias, Elias, you shine like a star. Willa: (also sings) We love you Elias, just as you are. Elias: I rode on a train outside. Willa: Was it a monorail train? Elias: Rode on a Mallard train. Mama rode with me. Went up in the passenger car. 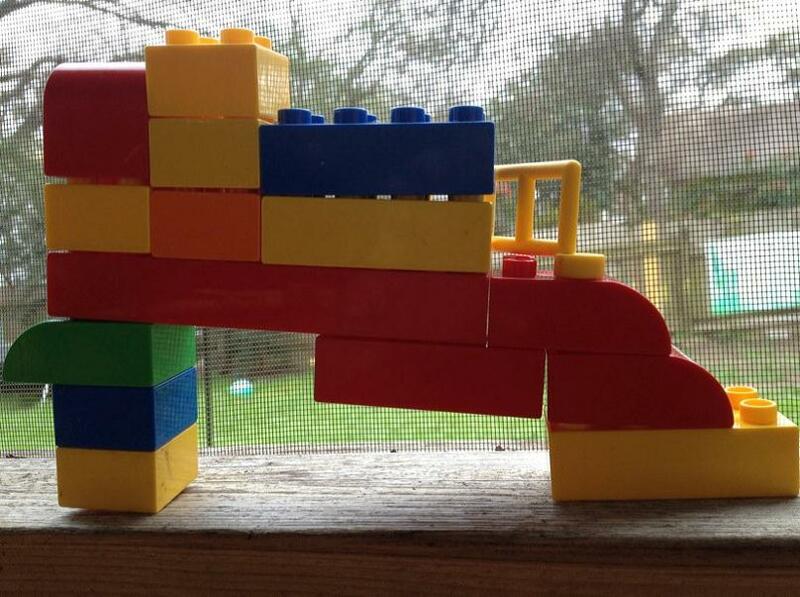 Emerson: Made a passenger train. Train interest is now very present in our classroom. 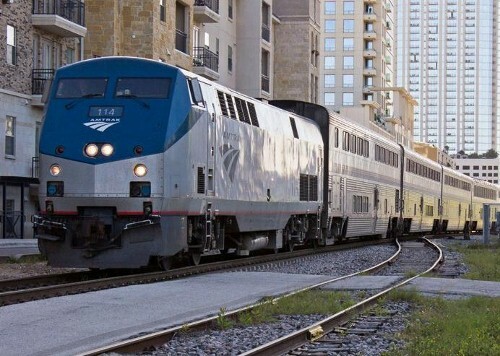 The parents and I plan what will be the first of three visits to the Austin Amtrak station. In our program, field trip experiences come in threes. The first visit lets the children focus on the magic of a new place: everything is new! If you see a ladybug on the sidewalk, well, perhaps that sidewalk always has a ladybug. A second trip allows us to test those initial impressions and gather more information. On a third visit, children have become experts about their encounter. The children and I prepare for our first visit. We make a list of the things the children think they might see. I hope the list will help organize their interest on our visit. After making this list, Nayeli decides to make her own list. She sits down to write all the words the children have said. Nayeli: I wanted to write down about what we had to say. First I draw pictures of the trains. Choo choo choo! (makes small circles going up on the top right). Choo choo choo! Choo choo choo! Okay, ah, we said . . . Emerson said . . . (makes left-to-right row of marks on the paper) he would see a locomotive (more marks). I don’t know what Elias said. Marie: Would you like me to read it to you off of the list? Marie: “Elias says I will see an Amtrak train” at the station. Nayeli: (Writing) Elias said . . . I would see an Amtrak . . . at the station. 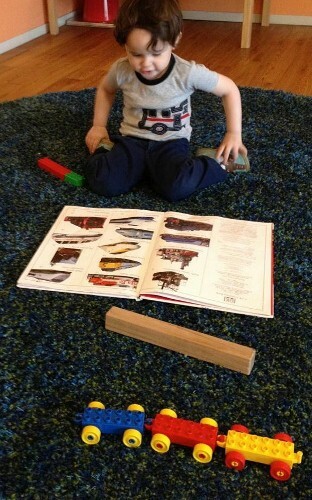 Elias: (Listening, also looking at the train book) That’s an Amtrak train! Nayeli: I have ideas on my list. What did Willa say? Nayeli: (Writing) Willa thinks . . . she will see . . . toys. 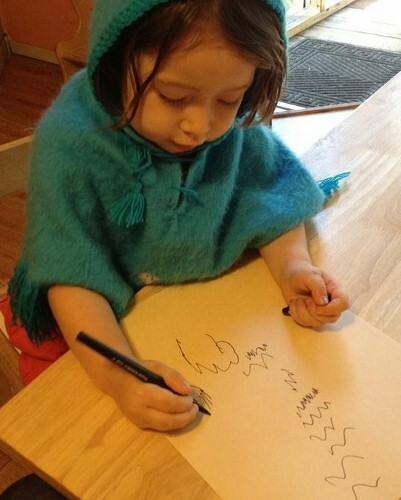 (Points to these new marks) This says Willa thinks . . . she will see . . . toys. Elias: (Looking over the list with us) I will see an Amtrak train. It has windows. Nayeli: What did Emerson say he thinks he will see? Marie: (Reading) Emerson says he will see a locomotive. Nayeli: Okay. (Writing) Emerson says he will see a locomotive. Anything else he said? Okay, anything that I said again? Marie: Here’s what I have: Nayeli says there will be trains. 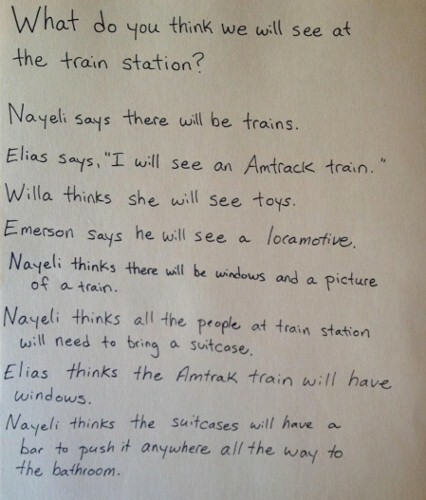 Nayeli thinks there will be windows and a picture of a train. Nayeli thinks all the people at the train station will need to bring a suitcase. Nayeli: Yeah, because you will need to pack up your things in it! And there’s a bar to push it where you want to go. If you push it all the way to the bathroom that will be really far! Marie: Should we write that? Marie: Are you finished? May I put your list next to mine? Nayeli: I forgot to say conductor on it! Con-duc-tor. I write about conductor here. I will give this list to the conductor, so that way the conductor will remember what his name was on it. To be continued in Part 2, coming June 21.